It’s a one layer challenge at Less is More this week to use exactly three stamps: no more,no less. I have used the girl and purse from “Hello Gorgeous” and a slightly altered sentiment from Sweet Wishes. I covered part of the word “birthday” with a post it note so that I could wish someone a fabulous day! The green and blue panel is sponged with Memento New Sprout and Bahama Blue, Then stamped the images in Versafine Onyx Black. The girl’s outfit is coloured with Faber-Castell Polychromos pencils. This is a different kind of image for you Heather… but the sponging is characteristic of your fabulous style. Heather I love this cRD AND THIS BEAUTIFUL STAMP. iT’S GORGEOUS. Fabulous colours on this card. What a fun way to use this kind of image! 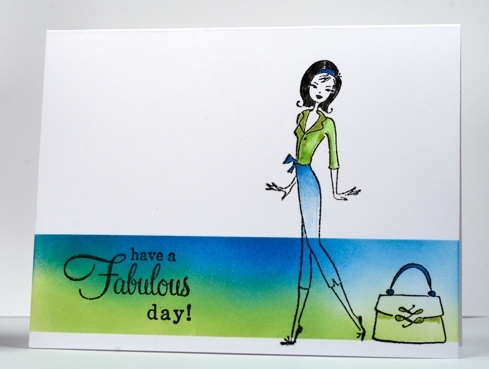 Great card – love the coloured panel at the bottom and the way you’ve used the same colours for the girl!! Even when I am in a hurry, when I see you posted something, I HAVE TO take a look. Your card is gorgeous. These are beautifull colours and I like the scene you created. Took a look at the whole sheet of Penny Black and I know now why they called it :”Hello Gorgeous”. Amazing! Do you have any tutorials? Your Less is More sure is packed with MORE!! Fabulous colors for this ultra chic design! I love this – very chic and the colours are gorgeous! Love your rich colours. I think I would find it very tricky to put images like these together with a sponged panel, but you really make it work! What a fabulous colour combination Heather . Love the images and the clever way you masked the sentiment. A superb CAS card. Heather – this is absolutely brilliant. Love the sponging and complimentary colours on the girl’s clothing. Inspired!